Walking Ballista combines flexibility, combo defense, and raw power. 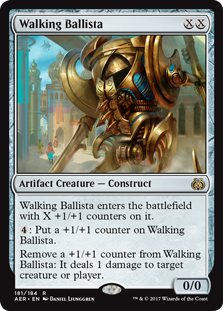 Possibly the strongest card in Aether Revolt, Walking Ballista is the true inheritor to Hangarback Walker. Walking Ballista had a heck of a coming out party at the Columbus Open! Heavily featured in several different successful Golgari decks, this new Artifact Creature – Construct will have a massive impact on Standard for months or even years to come. Walking Ballista can potentially find a home in green-white or other color combinations, but it may be at its best in green-black. This is because of the great synergy the card has with the many +1/+1 counter cards in that strategy. Winding Constructor – The best buddy unique to green-black, Winding Constrictor on turn two allows you to drop Walking Ballista as a 2/2 on turn three (maybe even playing a land like Hissing Quagmire). After that, every four mana is actually worth two +1/+1 counters! Rishkar, Peema Renegade – The combination of extra +1/+1 counters and ancillary mana ramp contribute both size and staying power to this great creature. Nissa, Voice of Zendikar (or Verdurous Gearhulk) – These cards are great with any creatures, sometimes going wide, sometimes going tall… What about when they can give you an instant machine gun? Walking Ballista is a value-laden creature. It is hard to trade with profitably, and is hell on little guys. Given time, it will take a game over all by itself. And of course, any and all synergies with green’s +1/+1 counter cards. None of those things is the most important part of Walking Ballista, contextually. Walking Ballista can break up (or at least slow down) the Saheeli Rai / Felidar Guardian combo by itself. 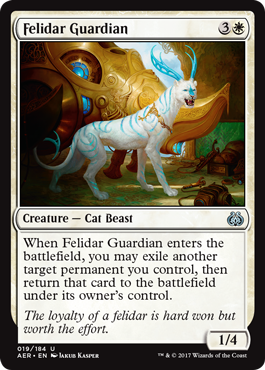 When Saheeli Rai first uses her [-2] ability to pair up with Felidar Guardian, she will momentarily drop to one loyalty. Even the smallest “Mogg Fanatic” Walking Ballista can execute her with ease. Will that stop an opponent unconditionally? Of course not. But it can buy you time… Time that you can use to just make bigger Walking Ballistas! At some point you can out-damage even a sandbagging Saheeli, or at 4/4 or greater, shoot down the Cat Beast instead. 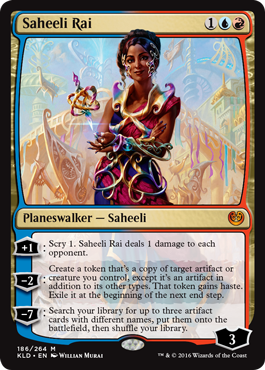 Saheeli Rai is suddenly the most popular Planeswalker from Kaladesh! What are different ways we can play her? There are many ways you can achieve nigh infinite damage. You can start on Saheeli Rai on turn three and follow up with Felidar Guardian on turn four; you can play Felidar Guardian on turn six, “blink” one of your lands, and then play Saheeli Rai. In either case the planeswalker will copy the Cat Beast, which will then blink the planeswalker. Rinse and repeat. This combo is exceptionally powerful. It can do an amount of damage with almost no ceiling. A Control Deck – This version will be full of cards like Disallow and Torrential Gearhulk. This looks to be the intuitive way to build the combo in Standard; the problem is that — aside from Felidar Guardian blinking Torrential Gearhulk, neither card is particular good with the other fifty-two. A Ramp Deck – Not necessarily a green deck… Inspiring Statuary or other artifacts can work here. A 187 Deck – This deck would play cards like Pilgrim’s Eye or other value-rich creatures. The advantage here is that both Saheeli Rai and Felidar Guardian can be synergistic with the other creatures in a deck. Maverick Thopterist, for instance, can protect Saheeli Rai with multiple bodies, and also enjoy copy- and blinking-based 187 synergies. Far and away the most common, and mana efficient, spoiler to this strategy is the simple Shock. Its inclusion in Aether Revolt may be almost prophetic; Shock has always been super cheap and reasonably flexible… It can add “combo killer” to its roles as quick creature defense and pillar of The Philosophy of Fire. Saheeli Rai drops to Shock range when she moves to copy a Felidar Guardian, even if you spent the previous turn ticking her up. The combo can be vulnerable to other interaction and removal (even a 1/1 Walking Ballista, if well placed); and Felidar Guardian is just a creature, if four toughness. Cheer Patrick and the rest of Team Top Level on at PT Dublin and all year. The rest of these guys include multiple Pro Tour winners and the reigning World Champion. Go Team Top Level! “Fair” card Gifted Aetherborn is a huge upgrade to a longtime favorite. Aether Revolt is busted wide open… Right? Much of the chatter around new set Aether Revolt is around its powerful combos and mana engines. Felidar Guardian is the most visible combo option at this point (one half of a Splinter Twin-like strategy in Standard), but it is not alone. Crackdown Construct and Wandering Fumarole together create a single infinite/infinite attacker. Inspiring Statuary threatens to headline an abusive new mana engine. This is the Aether Revolt we are all looking at, right? It turns out that — in addition to the mana engines and sources of infinite damage — Aether Revolt is chock full of some of the tightest, most efficient, “nuts and bolts” cards in many sets. “Fair” Magic here we come! Gifted Aetherborn is just one of many outstanding “fair” cards in a supposedly broken set. 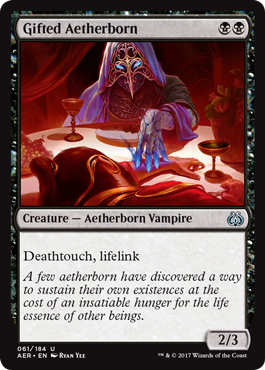 Let’s talk about Gifted Aetherborn for a second… This is a creature that trades Vampire Nighthawk’s flying for a single mana. Wow, what a trade-off! Flying is nice, and it certainly mattered some of the time, but Vampire Nighthawk’s reputation was never made on the basis of flying. Vampire Nighthawk was played — at least initially — due to its mix of enough toughness (3) to survive some fights, a “must kill” status as an anti-burn tool, and a continual source of value (or even card advantage) via its combat abilities. To wit: Vampire Nighthawk was a great 3-4-5 setup man Vampire into Huntmaster of the Fells and Thragtusk… The Nighthawk was itself a great stop sign against other Huntmasters. But cutting a mana from three to two? Sure there is a mild decrease in functionality, but that’s like transforming Incinerate into Lightning Bolt! Consequently, Gifted Aetherborn is going to be an exciting “fair” card that will see a ton of play in a ton of different strategies. Kari Zev’s Expertise – Mike is already partial to Threatens; this is the best Act of Treason ever printed. Think about playing Ancestral Vision for free in Modern! Metallic Rebuke – Substantial upgrade to Spell Shrivel; turn two Metallic Rebuke is going to be really good friends with turn one Thraben Inspector. Let’s say you ain’t got nothin’. It’s turn three and you play your Rishkar, Peema Renegade… This new Legendary Elf Druid comes down as a 2/2 with one +1/+1 counter (so a 3/3). That is essentially sized as a Trained Armodon Gnarled Mass. Difference is, this one can tap for G. And any future creatures with any counters on them can also tap for G! That’s right. “Each creature you control with a counter…” not each creature with a +1/+1 counter (i.e. from Rishkar, Peema Renegade itself)… Any kind of counter! So if you block and get a -1/-1 counter from, say, Infect your now-downsized creature gets to become a Llanowar Elves. We’ve already seen Yehenni’s Expertise from Aether Revolt. Rishkar has apparently got an expertise as well. Based on Sram’s Expertise we’re guessing Rishkar’s Expertise will let you play a three mana card for free. Actually the Command Zone knows. Check out the Command Zone later today to find out what the other side of Rishkar, Peema Renegade looks like. Aether Revolt looks to be thick with +1/+1 counters and +1/+1 counter synergies. Limited Resources revealed Winding Constrictor. It’s hard to imagine a better setup man for Rishkar, Peema Renegade than Winding Constrictor. The Winding Constrictor comes down as a 2/3 on turn two. 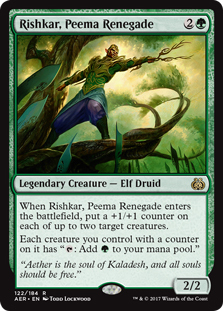 You play Rishkar, Peema Renegade on turn three; due to Winding Constrictor, Rishkar will deploy four +1/+1 counters! It will be like a mini-Verderous Gearhulk! 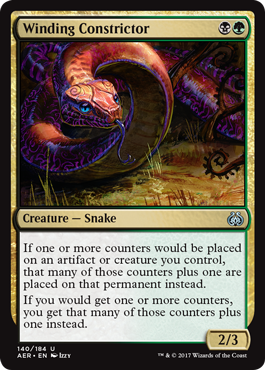 Winding Constrictor will be 4/5 and Rishkar will be 4/4! More than pure size (which is great for five total mana), you will have additional mana and +1/+1 counters possibilities locked and loaded for future creatures.